July 18, 2003 Harold Van Aken - The history of Parkston is somewhat of a mystery since development in the area was at a very early time when the first people came to Sullivan County. The early development was the result of the demand for lumber in cities downstream where timber could easily be delivered by way of the Willowemoc, Beaverkill and the Delaware Rivers, long before railroads and barges were used. Philadelphia was in a peak growth time and many of the buildings were built of wood and nearby forests had been depleted by the late 1700's. Kingston and Esopus Land Scarce - The development of Parkston started when the Esopus and Kingston areas were becoming populated and there was no low-cost empty land for the many children of the settlers who came to the area after the revolutionary war. Undeveloped lands were available in the Neversink area and that was the direction that many of the children of established families in the Kingston and Esopus went in the 1790's. 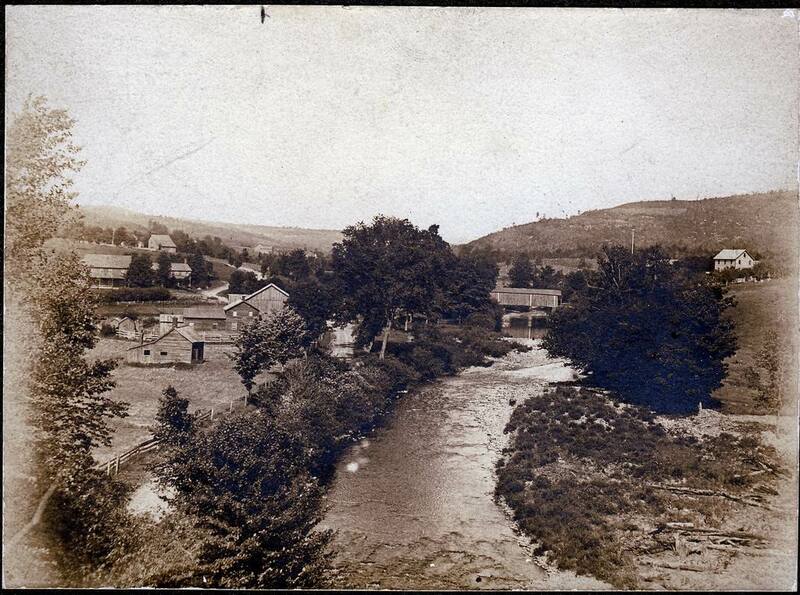 Neversink Grows - Land was cheap in Neversink and attracted many from Kingston and Esopus who grew up on a farm and were looking at farming for a living. Kingston was becoming an urban area with many of the farms consumed by the growing city. Connecticut was also running out of land and this became an area to expand into too. Three young men moved to this area in the Neversink valley to build their fame and fortune. They were Isaac Van Aken and Peter Woolsey from Esopus and William Parks from Litchfield County in Connecticut. They got land grants and started by clearing the land. William Parks had moved there first with his family and was well-established when Isaac and Peter arrived. The violent Neversink - They soon found farming to be a hard life and the timber that they had cut was in demand but delivery to the urban areas was difficult and expensive. They heard about the demand for timber in Philadelphia and learned that the Neversink River flowed into the Delaware and the Delaware flowed through Philadelphia. They cut timber on their land with the intent of floating the logs down the Neversink. The water was too low during normal times so they built their "ponies" of logs tied together and waited for the rains and high-water. When the rains came the Neversink was so violent that the ponies broke apart and all the logs were lost before reaching the Delaware. Many attempts were made by others to use the Neversink but nobody was successful because of the unpredictability of the River. The Willowemoc - Isaac Van Aken and Peter Woolsey looked for a better source of timber and a larger river to float the logs down. They found that the upper end of the Willowemoc was too small to float logs but the area above Purvis was undeveloped and the river was large enough to make small ponies that could be floated down to Purvis where the river got deep enough for large ponies. About this time a Peter Millspaugh had moved to the Neversink area with the intent on farming but saw the opportunity in timber and went with them. The area that they got grants with the help of William Parks was from below DeBruce to the current Parkston. They found that it was fairly easy to cut the logs lash them together into small ponies and then float them down the river to below Purvis where they were connected together into larger ponies that could be floated down to the Delaware. Once at the Delaware they could be sold to others or someone could be hired to take them to Philadelphia for the 10-12 day trip. The Timber Business Changes - After several years they had cut the choice timber near the river and they found they could get more for their timber if they sawed it up before it was sent down the river and the loads were considerably smaller but returned much more money. 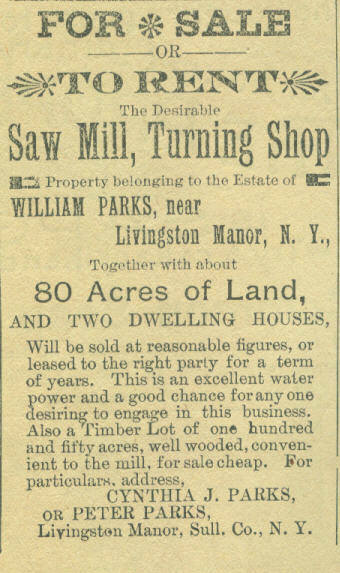 Peter Woolsey was more interested in the business of selling and buying timber and Isaac Van Aken and Peter Millspaugh were more interested in setting up a sawmill. Peter set one up at the brook by Jerseys and Isaac set one up in Parkston. Peter had a fast running brook but he didn't have enough water power in the summer that he could run the saw all the time. He found that if he went up the river he could build a pond to power his sawmill. This is the pond that is still there below Sammy Dorfman's. Isaac built a dug way from the Willowemoc to a feed a pond that he built in Parkston that has since dried up. Woolseyville - By 1809 the area became known as Woolseyville since Peter Woolsey controlled all the timber in that area and had moved to the area and become known as the man who managed all timber in Sullivan County. The mills expanded hiring many men to cut and skid the logs and houses were built for them. Peter Millspaugh had a larger area and better trees so his lumber business continued to grow. Isaac soon depleted most of the large logs that boards were made from but discovered he could make more money if he started producing table legs, chair legs, spindles and other wood products that are produced on a lathe. He made a "turning mill" that was powered by the pond he had made for the saw mill. He soon found he needed more water power so he enlarged the pond and dammed a part of the Willowemoc to feed his pond. He found that he couldn't deliver "green" turned products because they would warp as they dried. He built a "drying barn" that could be used to season the spindles before they were sent down the river to market. This barn was told to be built the year Lincoln was born in 1809. 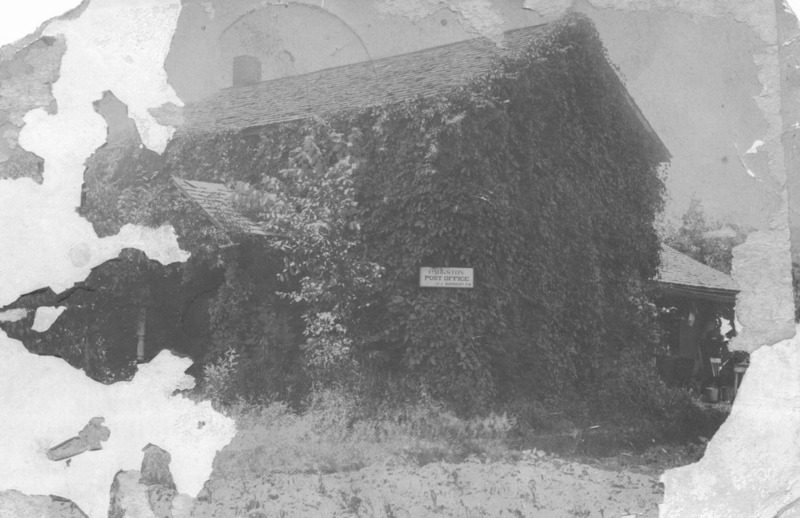 The barn was used for dairy farming by the Barnharts and Laceys and lasted until the year 2000 until it was torn down before it fell down. Back to Civilization - Isaac Van Aken had met Margaret Krum in 1807 and married her and started a family in Neversink. He traveled back and forth for many years because Margaret would not move to an area where there were no stores or neighbors, just a bunch of rowdy loggers. It would take half a day to travel from Neversink to Woolseyville and Isaac soon tired of living in two different places and sold his business to William Parks. Isaac then went back to farming in the Neversink area and had 7 children. The Parks Come to Parkston - The sawmill and turning business was well-established and only need managing so William Parks had his eldest son Elijah managing the business. Elijah was the first-born white male in Sullivan County in 1791 and unsuccessfully ran the business for a few years and then his brother Joseph took over but he was more interested in farming than timber. When Joseph's son William was old enough he worked in the saw and turning mill and was running the mill in 1846. William Parks Sr. died in 1846 and the land he had got grants for in Parkston was divided up among Joseph's 4 children: William Parks got the saw mill and the next lot for a total of about 160 acres, Peter Parks got the 80 acre lot at the top of the hill where the Lorraine Hotel was built, Cornelius got the next 80 acre lot known as the Zivian lot and Catherine Parks got the current 80 acre Van Aken lot. Peter Parks moved to the area to help his brother with the saw mill and to cut the logs on his property. He built several houses from the lumber on his property. The Cornelius Parks Family Move to Parkston - Cornelius who was married to Hester Ann Overton and working on his fathers farm between Parksville and Purvis decided he would move to his land and make a farm there in 1868. The first year he traveled by foot over the mountain from Parksville until he had built a small log cabin and barn down by a small brook that runs into the Willowemoc River. There was no road over the mountain from Parksville or up the river from Purvis yet and the only means of travel was the Willowemoc River with oxen and sleds, the same path that was used to float lumber down. He moved his family and possessions up the river to his new home and cleared the land for farming. His daughter Cora, my gGrandmother, told me about the trips up and down the river with the oxen and "stone sled" until the DeBruce road was built in about 1874. The next Spring, there was a major flood of the Willowemoc and Cornelius' barn was destroyed and water flooded his house when there was an ice jam. This caused him to build another house and barn much higher on the hill. 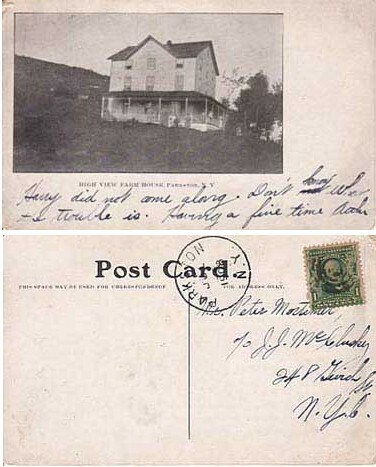 The house is still standing today but the barn was torn down several years ago and the barn boards sold. 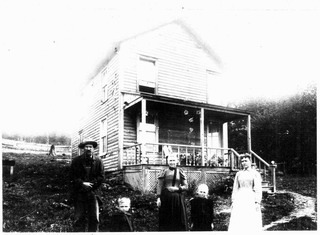 The picture to the left is was taken in 1894 of Cornelius Parks, Herbert Van Aken (my Grandfather), Hester Overton, Pearl Parks Finn, Cora Parks Van Aken (my Great Grandmother) in front of the second house he built and is still standing today. The Timber Business Changes Again - The O&W railroad came through Purvis in the 1870's and this changed the timber business in Sullivan County. Finished lumber could be shipped anywhere in the country once it was on a train car with no handling and little danger of losing the shipment. Floating logs down the Willowemoc and Delaware ended abruptly with the coming of the train since the logs would arrive sawed up and dry in a couple of days instead of 10-12 days with the risk of losing the whole load. Even floating the logs down to Purvis and loading them on the train was more expensive then hauling a load of lumber by wagon and oxen. This resulted in a road built from Woolseyville to Purvis shortly after the train came to town so that products from the Parks Mill and the Millspaugh Mill could be sent to Purvis and loaded on the train and the river was never used for travel again. The arrival of the train made the cost of getting lumber to market much lower but it also meant that lumber could come from places farther away in Pennsylvania, upstate NY and even Canada where high-grade pine was preferred for building material. This eventually caused the price of lumber to drop so low that both mills went out of business in the late 1800's. 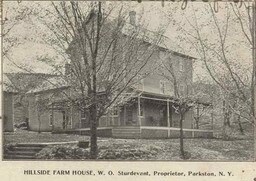 Parkston Farms - When the timber business subsided, much of the land that had been cleared of timber were used for farms. William Parks sold the sawmill and buildings to George Barnhart who used it as a dairy farm. 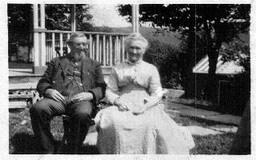 His house became the post office and his wife Matilda Margaret Lewis Barnhart (my Great Grandmother) became the post master for Parkston as it was called then (Picture at left). 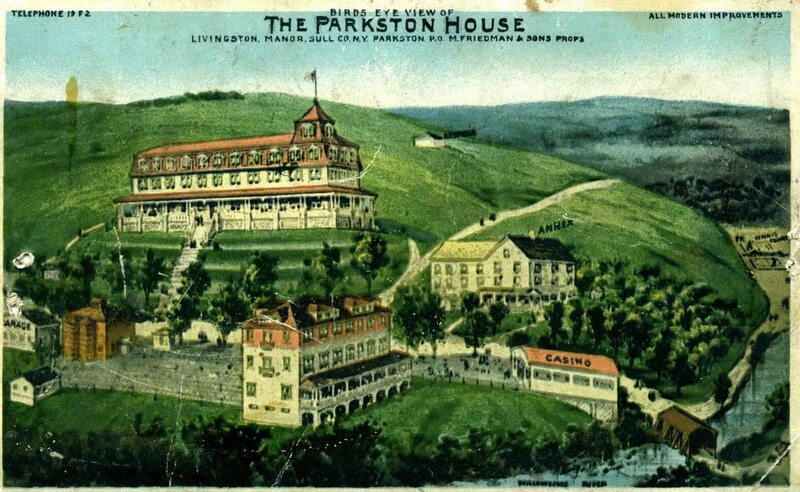 Parkston was booming then and had a store and bar as well as about 30 houses. Sturdevant had a farm across the river with a barn and house but with little flat land (picture to right). The peter Parks land had a barn with about 60 acres of cleared land. Cornelius Parks who had always been a farmer had cleared most of his 80 acres of land. 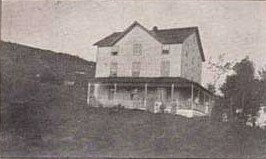 The Wolcott Place was a farm of about 100 acres but was across the river and could only be reached by fording the river. The Bush farm above Catherine Parks lot was a large farm of 100+ acres with a pond, barn and the best Spring water around. Loucks bought some of the land where Millspaugh had their mill and farmed the cleared land until Jersey bought the farm. The Borsht Belt and the Summer Hotels - The boarding houses were filled to capacity each year no matter how many rooms were added to the farm houses during the Winter. Many entrepreneurs saw this as a goldmine and flocked to the area with lots of cash and bought up the farms. Many were business people whose family stayed at the boarding houses in the summers before. Most of the owners of the boarding houses were getting up in years and wanted to get out of the business. Hotel Capitol - William Parks sold out to a New York City Man, Isaac Goodman, who built a 4-story hotel with capacity of about 100 guests. He enlarged the pond that was used for the saw mill and made it a swimming and boating pond. Interestingly enough he bought the property and pond but didn't own the dam for the pond. He had an icehouse that he would store the ice he had cutfrom the pond in the Winter. The ice was stored in sawdust and would last the whole summer. He built several guest houses as well as a house for his wife and him to live in. His dance hall or annex as he called it was filled and rocking (hava nagila!!) every night during the summer. (Richard and I used to sneak into it and buy cigarettes when I was a kid and watch them from the outside). Hotel Lorraine - Peter Parks sold out to another NYC man Samual Gerber who built a 3-story hotel with capacity of 80 guests. 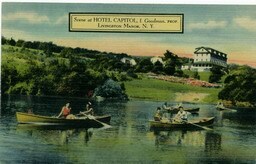 He added many buildings for the help and a dance hall to compete with the Hotel Capitol. The two hotels were within 200 yards of each other and were always in competition for guests by providing the best entertainment and the best Kosher food. He didn't have a pond like the Capitol so he dammed the Willowemoc River up each year to make a large swimming area. He dammed it up in back of the house that I grew up so we had a great place to swim but the environmentalist certainly wouldn't allow that now. Whenever there was a heavy rain the dam would go out and they would have to come again and rebuild the dam. Zivian House - Cornelius Parks (photo at left) saw the opportunity and sold out to a Max Zivian who tried to compete with the hotels with just his boarding house. He soon failed and sold to Gerber. 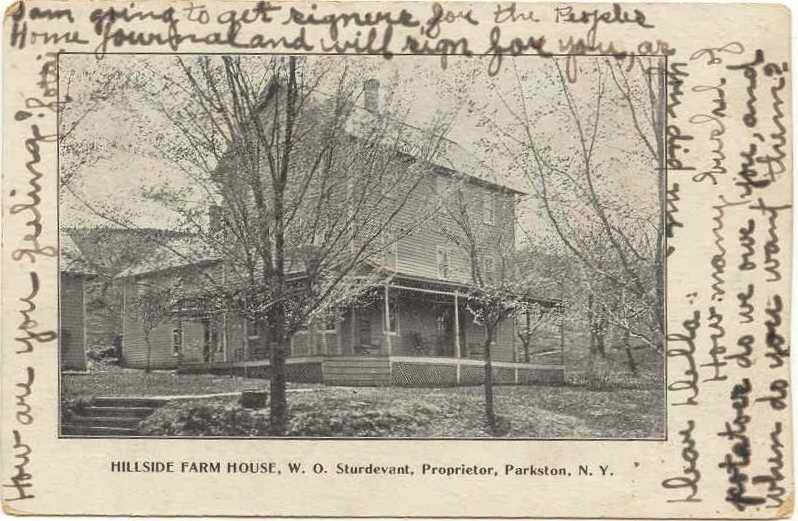 Parkston House - Sturtevant's farm and boarding house sold out to another family from the city, Friedman (Mike Friedman's parents). They built three buildings: a three story hotel with capacity of 100 guests, a another three story building for the help and guests and a dance hall for entertainment (picture to right). They had an icehouse that they filled from the lake they built on the only level ground that they had and with many yards of sawdust they had ice for the whole summer. Note the covered bridge crossing the Willowemoc and how cleared the land was. Kenmore Hotel - With no more farms to buy there was vacant land across the river and with the new covered bridge across the Willowemoc it was easy to get to. They built two 3-story hotels, houses for the help and several bungalows. He built a lake on a side hill and cleared acres of swampland. He was able to house about 200 guests and was one of the more successful hotel that lasted until the end of the 60's. The "big" hotels were booming and the O&W train from NYC was packed on a Friday night and the population of Purvis would triple during summer weekends. Extra trains were added but were still filled to capacity. There were many complaints about having to stand the whole trip from the city. 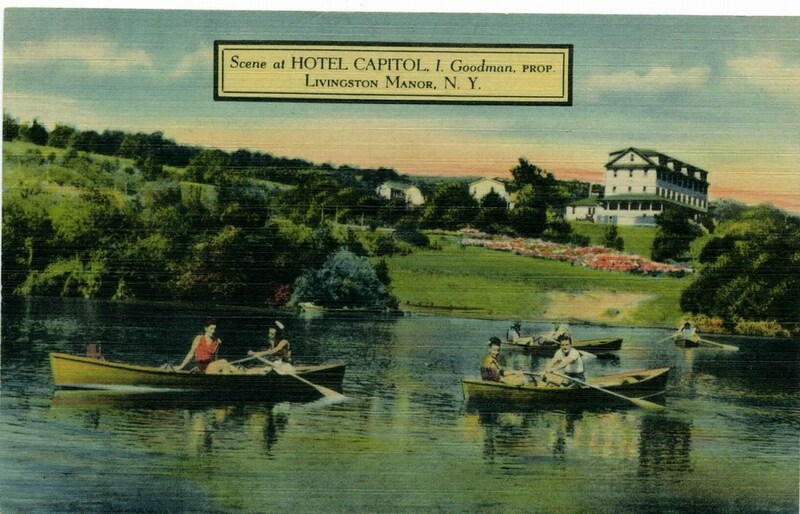 The town was filled with "livery wagons" to take the guests to the hotels and you could barley walk down the streets of Livingston Manor (the name was changed from Purvis to attract the people form the city). Some of the places boasted "the only motorized livery wagon" (Sturtevant's) as an incentive to go to their place but that was soon to change as the automobile came into popularity. 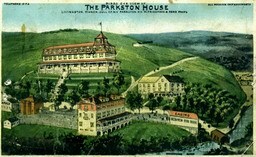 Many thought that the advent of the car would kill the hotel business in the Catskills but it increased the people that came to the "mountains" by droves. The convenience of packing your car and going when you wanted became very popular. This hurt the railroad business but soon became a problem when the roads were packed and a trip from the city took longer than the train because of poor roads and lots of traffic. This led to the development of Route 17 which by standards of the time was a super highway when completed. One could make it from the city to Livingston Manor in 4 hours, 2 hours less than the train and you didn't have to wait for the hotel car to pick you up. This was pretty much the death toll for the O&W railroad and it stopped service in the 50's when passenger service dropped to a level that would not support a railroad - America had fallen in love with the automobile. ...but then What Happened - in the early 60's the Borsht Belt Hotel business disappeared. There were a few big hotels like the Grossingers, Concord, and Browns but the small hotels disappeared. It's not known exactly what happened to make this happen but it was probably a combination of older generations dieing off and the superb entertainment and facilities the the very large hotels could offer for not much more money. This was also the time that air travel became more affordable and it was fashionable to take a vacation by "air". The roads improved to where you could be in Florida in 24 hours or any other place East of the Mississippi and cars were much more reliable and could make a trip to Florida and back without maintenance. In the late 30's and early 40's if you were taking a trip to NYC it would be expected that you would have at least one flat tire on the trip and you would patch it and pump it up and be on your way. ...and then - After all the small hotels closed and most went bankrupt or let them go for taxes something happened: The hotels could be bought for a song and the Hasidic Jews took advantage of this and bought up all the hotels. There were an influx of Hungarian Jews and other third world countries that they fled from persecution and the old "Borsht Belt Hotels" became a summer retreat from the hot streets of Brooklyn in the summer. Most of the hotels were in a state of disrepair and had little maintenance through the 60's and 70's. Many burned suspiciously during that time and was commonly know by the locals as "Jewish Lightning". Today there are still a few camps that have survived, the Kenmore being one of them even though the main two building have burned since the 60's. This entire article is based on growing up in Parkston and my experience, knowledge and what people have told me about how the history of Parkston. Many of the facts are true and documented but none of the statements are knowingly false, only my best guess of what happened and a few fantasies.